Smoked Capriko starts with our award-winning Capriko , a semi-hard cheese made from a blend of fresh goat and cow milks. The cheese is slow smoked using natural hardwoods, never chemicals. The smoking process keeps Capriko’s firm, yet creamy mouth feel and adds a layer of rich smokiness to the sweet, nutty flavor of Capriko. Smoked Capriko is a bold cheese that feels right at home in a turkey sandwich or on five star cheese plates. 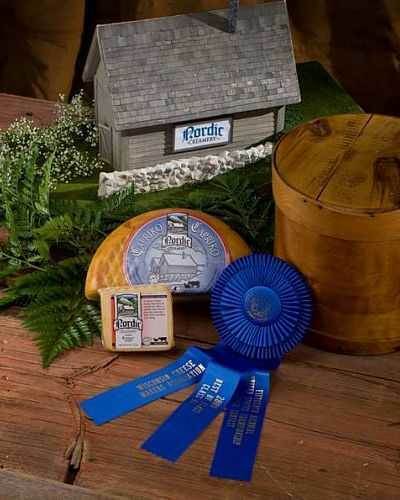 Nordic Creamery cheese is produced only using the highest quality milk from small family farms, near Westby, Wisconsin, within the lush green hills and valleys known as the Driftless Region. Pearl Street Brewery Recommends: Smokin’ Hemp Porter. This seasonal Porter is as unique as its name, and if you love smoke, really love smoke, try doubling down! Pearl Street Pale Ale works as well with the smoked version of Capriko as it did with the regular one. Service Area: Westby, La Crosse, Onalaska, Tomah, West Salem, Madison, Stevens Point, Fond Du Lac, Rhinelander, Waukesha, Wisconsin Rapids and surrounding communities.